In 1943, four local newspapers published a New York City Market Analysis. Largely forgotten in the 70 years since, the document provides an amazing window into New York's neighborhoods of that era. The 250-page Market Analysis provides hundreds of photos & color-coded maps, statistics, and short narrativesabout neighborhoods across the city. The statistics and maps are based on the 1940 Census, providing a rich complement to the individual 1940 Census records that are available online. 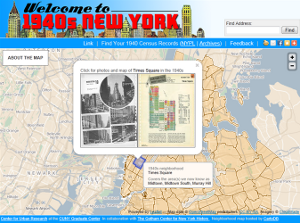 The Center for Urban Research at the CUNY Graduate Center is making the 1943 profiles available to provide context for the 1940 Census records and to offer a research aid to historians and anyone else interested in learning more about New York from the 1940s. Read our announcementfor more info. zoom in on the photos and color-coded neighborhood map to see the images in great detail. We have also analyzed some of the demographic changes in New York City between 1940 and 2010. Please visit CUR's website for more info.